Astronomers have discovered an enticing new planet that could be considered our next-door neighbor. The planet is orbiting a star in the Alpha Centauri system — the closest system to our own, just 4.3 light years away — and the planet has a mass about the same as Earth. It is also the lightest exoplanet ever discovered around a sun-like star. While this planet is likely too hot to contain life as we know it, the star system could possibly host other worlds that could be habitable, researchers from the European Southern Observatory at La Silla say. “This result represents a major step towards the detection of Earth twins in the immediate vicinity of the Sun,” the team wrote in their paper. The planet is called Alpha Centauri Bb and it whips around its star every 3.2 days, orbiting at a distance of just 6 million kilometers (3.6 million miles), closer than Mercury’s orbit around the Sun. (Earth orbits at a comfortable 150 million kilometers (93 million miles) from the Sun.) So it is likely very hot and covered with molten rock, the researchers say. Many astronomers have thought that the Alpha Centauri system would be a perfect candidate to host Earth-sized worlds. In fact, in 2008, a team of astronomers ran computer simulations of the system’s first 200 million years, and in each instance, despite different parameters, multiple terrestrial planets formed around the star. In every case, at least one planet turned up similar in size to the Earth, and in many cases this planet fell within the star’s habitable zone. But while astronomers have looked for years, previous searches of planets in the Alpha Centauri system came up empty. The European team detected the planet by using the radial velocity method — by picking up the tiny wobbles in the motion of the star Alpha Centauri B created by the gravitational pull of the orbiting planet. The effect is extremely small, as it causes the star to move back and forth by no more than 51 centimeters per second (1.8 km/hour). The team said this is the highest precision ever achieved using this method. Alpha Centauri is one of the brightest stars in the southern skies and is actually a triple star — a system consisting of two stars similar to the Sun orbiting close to each other, designated Alpha Centauri A and B, and a more distant and faint red component known as Proxima Centauri. Alpha Centauri B is very similar to the Sun but slightly smaller and less bright. The orbit of Alpha Centauri A is hundreds of times further away from the planet, but it would still be a very brilliant object in the planet’s skies. The first exoplanet around a Sun-like star was found by the same team back in 1995 and there are now 843 Exoplanets with the addition of Alpha Centauri Bb. Most are much bigger than Earth, and many are as big as Jupiter. The previous closest exoplanet was Epsilon Eridani b, 10.4 light years away. The challenge astronomers now face is to detect and characterize a planet of mass comparable to the Earth that is orbiting in the habitable zone around another star. The first step has now been taken, the team says. So, how long would it take for us to get to this planet? Using current technology, our slowest mode of space transportation, ion drive propulsion, it would take 81,000 years. Using the speeds of one of the fastest spacecraft (Helios 2) and traveling at a constant speed of 240,000 km/hr, it would take about 19,000 years (or over 600 generations) to travel the 4.3 light years. This is huge! Yeah, the world is probably hotter than Mercury (so no fun flying six legged carbon based creatures would exist there) but it does give hope to finding others. My prediction? 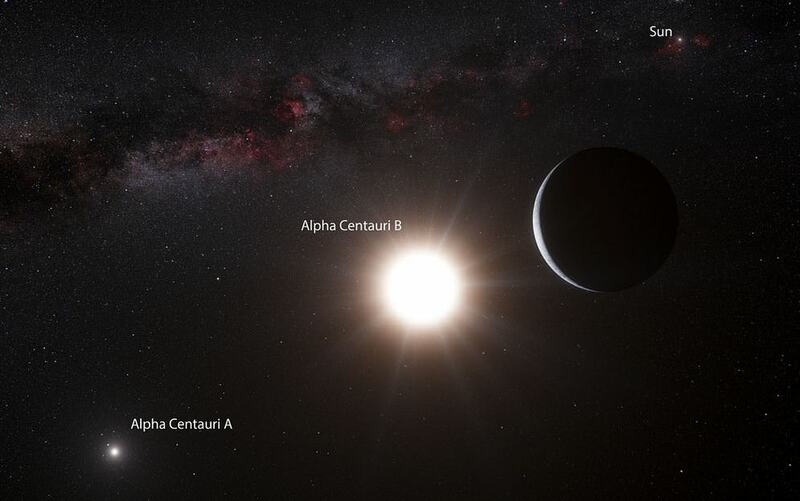 We will find more worlds around Alpha Centauri B and a promising one around A. Just a hunch! That could be. Stellar systems are a bit like Charley Parker’s “anything goes.” Before extra solar systems were found there was lots of phenomenology about how solar systems form. In recent times it has been found that configurations of planetary systems can be widely more diverse than previously thought. It makes some sense that if there is this one planet in a tight hot orbit around ?-Centuri then there should be others. However, star systems turn out to be a lot stranger than previously thought. I LIKE your reference to Charley Parker… I yam a fan! I can imagine you sitting there listening to that tune and thinking about this find. I used to belong to a jazz fusion group, we called ourselves, ‘The Spatula de Frijoles’. There were three cousins who had an EXTENSIVE collection of jazz records. Many times we would listen to Charlie Parker or John Coltrane for inspiration before going into the sound proof music room to jam…. TOOT! Finally! I was waiting for this news so long. I literally cries with joy when I read this headline! FOUR DECADES I’ve been fantasizing!! This is incredible news, if confirmed. Really cannot overstate how significant this discovery is. Earth orbits at a comfortable 150 million kilometers, not 190! Pity it couldn’t be in the habitable zone, but this is still news that have been waited for a long time. 35 years at 1/8 light speed. They should shoot a beer sized scout drone towards it. Yes, so true. If we can get a spacecraft up to 10% of the speed of life, a probe could get to that system in a lifetime. Now getting a probe to that speed, well…. We’re getting there, inertial confinement fusion (controlled antimatter annihilation) offers perhaps the beginnings for our ‘new’ propulsion system era, CERN’s latest antihydrogen confinement experiments stabilized antimatter for 16.64 minutes. @Victory_Sabre, I loved your idea, got me thinking. Sending a spacecraft to reach even 1% light-speed (Almost 3,000 km/s) would be quite a challenge. Though, an interesting challenge. Some suggest solar sails, laser sails, nuclear-ion propulsion, etc. None have been really used/tested, and are still long-term technology, but reaching 1% C would be quite a breakthrough. Not truly interstellar speeds, but still a huge effort. It could be the first step, making the nearest stars a lot closer. ideas which have some prospect I think this century. significantly red shifted ? = 1.15 or v = .5c is possible. I wrote a book on the physics of star probes. It is mostly a way to present physics at the sophomore to junior level, particularly classical mechanics and special relativity. The title is “Can Star Systems be Explored?” I consider various methods for sending spacecraft to low gamma relativistic velocities. SJStar, you put the sun’s distance from the earth in billions, rather than millions of miles. Obviously, you knew that but made a boo boo. Yeah. Just mistook a comma for a decimal point! Nancy: “Thanks! Conversion typo….” Same thing that happened to you… Wow, SJStar, you’re really quite a(n) ______. * Also be aware the Universe Today seemingly (deliberately) didn’t mention the IAU Conference in China. I personally wrote to Nancy on this a month ago or so about this, which she said she would investigate it as a storyline. My comment was that the AU distance was stated in the IAU change, which is in SI units. Reading 190 million suggest she just didn’t bother — and that bothers me when this site presumably prides itself on it accuracy. At least I was actually bothered to acknowledge my mistake. And I *didn’t* acknowledge the mistake?? It was acknowledged and fixed before you even wrote your first comment on this article, according to the timeline I have as admin on Disqus. So you were obviously making your comment based on the previous comments about the mistake and not the article itself. I know you relish pointing out my errors and shortcomings, but this is pretty ridiculous. I get greatly irritated when people pick on you Nanc. Your articles are half the reason I come here. Don’t be discouraged by naggy nitpickers. They need a kick in the shins if you ask me. Great news! Didn’t Lost in Space teach us this 50 years ago and why didn’t we look there first? Could it be a small pulse into the stellar atmosphere? To continue with this thread starting with Victory_Sabre above, I discuss these ideas in my book, “Can Star Systems be Explored?” I work the physics of the relativistic rocket. The energy required to reach ? = 2 or v = .87c is likely to demand the ability to convert matter 100% into energy. At ? = 2 the rocket at that velocity has half of its mass-energy in kinetic energy. So this requires a fairly extraordinary energy source. The obvious idea is to employ antimatter. This requires a very large amount of antimatter, which we currently are not able to generate. Difficulties in generating such large amounts of antimatter are daunting. Solutions to these practical problems are nowhere within sight. This of course does not mean the relativistic rocket is impossible, but if it is realized it will be a distant future technology. Regarding antimatter energy source, I don’t want to pour a bucket cold water over the possibility of interstellar space travel, but according to this paper (PDF), ~50% of the ‾pp reaction energy is lost due to various muon and electron neutrino particle-antiparticle pairs carring it off. Thanks for the reference. This looks fairly comprehensive and I will try to read as much as possible. Clearly the relativistic rocket is far off into the future. I mention this issue with p-p-bar interactions in my book. I then in my book consider using reaction mass that absorbs this hard radiation in the form of gamma photons and mesons. Compton scattering with reaction mass, which can mean putting more protons or hydrogen in than anti-hydrogen, reduces the energy of these photons and particles and would produce more manageable thermal-photon conditions It turns out that a fair amount of reaction mass can be used without compromising the theoretical performance too much if you are interested in low gamma velocities. We must also consider the anti-protons that are being captured within planetary magnetic fields. The universe has natural particle accelerators and are producing anti-matter all the time, and for ‘free.’ Some suggest mining for anti-matter inside Earth’s Van Allen radiation belt. According to the Italian PAMELA satellite, there’s more up there than we can ever hope to produce on Earth. Taking PAMELA’s limitations into account, there’s perhaps much more. I’d suggest building and launching a demonstrator craft, designed to experiment with harvesting and storage techniques. With enough anti-matter fuel, it could annihilate it using normal matter to demonstrate station keeping, or even a velocity change. This would be the first antimatter rocket. Not an interstellar vehicle, but a step toward it nonetheless. That would be interesting demonstration project. I am not sure how one would harvest the antiprotons in the van Allen belts. Magnetic separation appears to be an obvious possibility, but getting them into a “bottle” would be a challenge. This leads to the next difficulty, which is bottling antimatter. Magnetic fields have holes due to the dipole nature of the magnetic field and are not perfect bottles. Holding neutral anti-hydrogen is tough as well. I do remember this, I think was summer of last year or so. Of course trapping a few anti-hydrogen atoms is a long way from building a “tank” that can hold a lot of them that can be used as fuel. Almost all of those planets somehow migrating so close to their parent stars? Due to the limitations of observational technology and data, sample sizes are biased, but all of these systems currently discovered appear to be so unlike of our own Solar System? I recall hearing astronomers saying there wasn’t a very good chance multiple-star systems like Alpha Centauri could harbor planets – they’d get ejected, or the protoplanetary disk would get ejected. Glad to see it’s not true. This is fantastic news. I have wondered why Alpha Centauri has received so little attention. To me it’s the obvious place to look. A “wobble” of 51cm is extraordinarily difficult to spot over 4 light years. The amount of wobble is calculated from the Doppler shift in light frequency. That effect doesn’t change with distance (unless there are disturbances along the way like gravity sources or dust clouds or the distance makes the light too dim to measure). That was one pretty good calculated prediction! Now all we need to find is a nearby (within 2-3 bn km) warp gate so we can make a run for it. Watch out Centauri , here we come ! WAY double extra groovy cool! Neighbors! Am now full of hope that we will find a nearby but overlooked Red Dwarf star with planets orbiting… Large ocular ET’s anyone? LOL! A comment on high speed space travel. Even if we COULD achieve a large percentage of light speed, what good would that be? There are too many unknowns concerning extreme speed interstellar space travel. One rogue planet, comet or asteroid could ruin yer whole day! And at present, shielding for high energy particles might be the ‘show stopper’ for organics? Of coors, where there’s a will…..
Nancy, do you ever sleep? lol. Kudos for so many and so good-of articles! You’ve really been cranking them out lately. Fraser needs to buy you dinner the next time you all are in the same area! Thanks very much! I’ll pass on your suggestion…sounds like a good idea! I have to admit that the only thing which is amazing from my perspective is precision of measurment. This planet and rest of planets which have been found are beyond our reaching. But let suppose that we can reach them because we developed space ship whith speed limit of 0.5 c. The question is WHAT FOR we should go there? New resources? Rather not – we have planty of them on Earth and our Solar System and we can`t take them because of cost or lack of technology. Are we looking for different place to live? We won`t be forced to leave Earth even in thousends years. Are we looking for aliens? If they don`t contact as first they are probably less developped civilisation and we won`t get any unknown knowledge from them. So what is the REASON to go there? Awfully closed minded for a self-proclaimed sailor of space! Slightly more seriously than adventure, migration is a viable economy. Ask the birds. For a guy named Space Sailor, you sure come across as a mud-sucker. What reason have we to explore the universe??? Same as exploring the attic, under the stairs, the neighbour’s abandoned yard or the inside of a hollow tree…to see what’s there, to learn, to grow, to understand! Do you think all the answers are here in the dirt under your fingernails? To explore something so remote and alien is to either find out how similar the rest of the universe is or to marvel in the exotic nature of what we find! I don`t know why You are offending me but this is Your problem and best evidence that You don`t know what discussion means. Attack the problem not the person. There is no need to go there to “learn, grow, understand”. We can do to that remotly expecially with next generatons of telescopes and probably other technologies that we invent in near future. Torbjorn – all is a question of costs if we talking about economy. We don`t have sufficient data to measure it. Someone else called you “awfully close-minded”. But yes, clearly, this is all “my problem”. Haha. And you fell to attacking me right back, so clearly not above any of what you accuse me of! You were being a troll so you’re getting what you sowed. That’s all. – Having a planet around a nearby star: + 5 points. – Having our first Earth massed planet around a Sun like star: invaluable. There is no need to build a spaceship that can house humans. That would involve insurmountable technological advancements and impossible size requirements as well as being dubiously successful considering the necessary time to even leave our own system. No, we’ll send autonomous robots and rovers and balloons and orbiters in far less space, that could relay the info back so that in a much shorter time (no max 1g acceleration) we could explore from our homes using the medium of the internet.